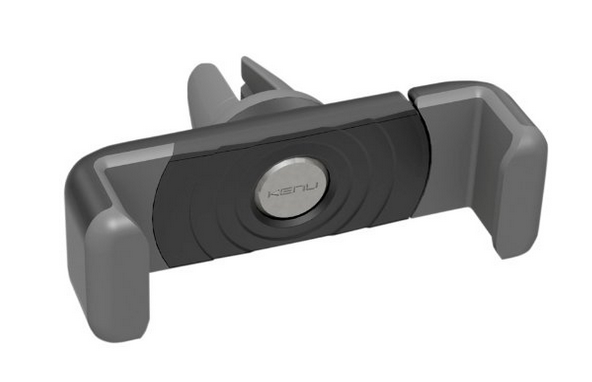 Kenu has released a brand new second-generation version of its popular Airframe iPhone car vent mount. Called Airframe+, the device is able to hold handsets with thicker cases and with screen sizes of up to six inches. Of course, the news comes some months ahead of Apple’s anticipated iPhone fall event, during which the Cupertino, California company is expected to unveil bigger handsets of 4.7-inches and possibly even 5.5-inches. As such, it seems Airframe+ is ready for Apple’s next-generation devices. While the new Airframe+ accommodates devices with screens up to six inches, body size is really the determining factor and the device grip expands to approximately 3.25 inches. Apple’s rumored 4.7-inch and 5.5-inch iPhone 6 models should, however, fit comfortably even with most cases. The Airframe+ also offers improved support for thicker cases compared to the original Airframe, allowing users of Mophie battery pack cases or thick Otterbox waterproof cases to use the mount. The release comes a couple of months after Kenu unveiled a white version of its first-generation Airframe; we highlighted the news in our weekly “This Week In Accessories” column. Much like its predecessor, Airframe+ includes two different grip sizes and these are designed to attach to a variety of different car vents. It’s worth stressing, though, that while Kenu advertises the Airframe as working with “any vent type,” this is unfortunately not the case. We attempted to publish a review of Airframe some time ago, but after receiving the product we found it wasn’t compatible with any of the vents in my car. You can’t argue with Airframe’s price, though: at $29.95, the Airframe+ is available to purchase now, while the first-generation Airframe is available for $24.95. Check out the new product, or see: Junk Jack X’s new update kicks off summertime sandbox gaming madness, The reviews are in: Amazon’s iPhone-competing Fire Phone fails to impress critics, and Yahoo Weather updated with twice daily customizable notifications.